With this set of stackables you can replicate the same delicious flavors that top chefs create in their kitchens, in the comfort of your own home! This set combines three of our most-loved salts. Packaged in convenient stackables, these salts always be the first thing you reach for in your pantry! 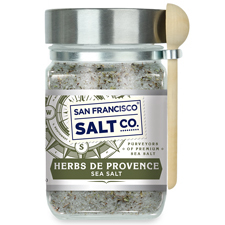 HERBS DE PROVENCE�-�Herbs de Provence is a delicate blend of salt and seasoning that smells as good as it tastes.�To create this blend, we infuse our Pacific Sea Salt with the exquisite flavors of Rosemary, Thyme, Savory, Oregano, Marjoram, and Basil; the result is an aromatic�salt that smells as good as it tastes! 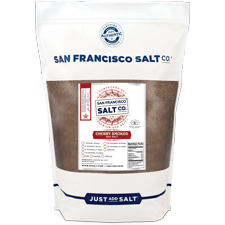 CHERRY SMOKED SEA SALT -�Smoked Cherrywood Sea Salt is made with pure Sea Salt that has been slowly smoked above a Maine Cherrywood fire - a centuries old process. The result is a smooth, slightly sweet tasting sea salt, without harshness or bitterness. This gorgeous, aromatic salt is a must-have for whenever you really want to add dramatic flavor to your dishes. 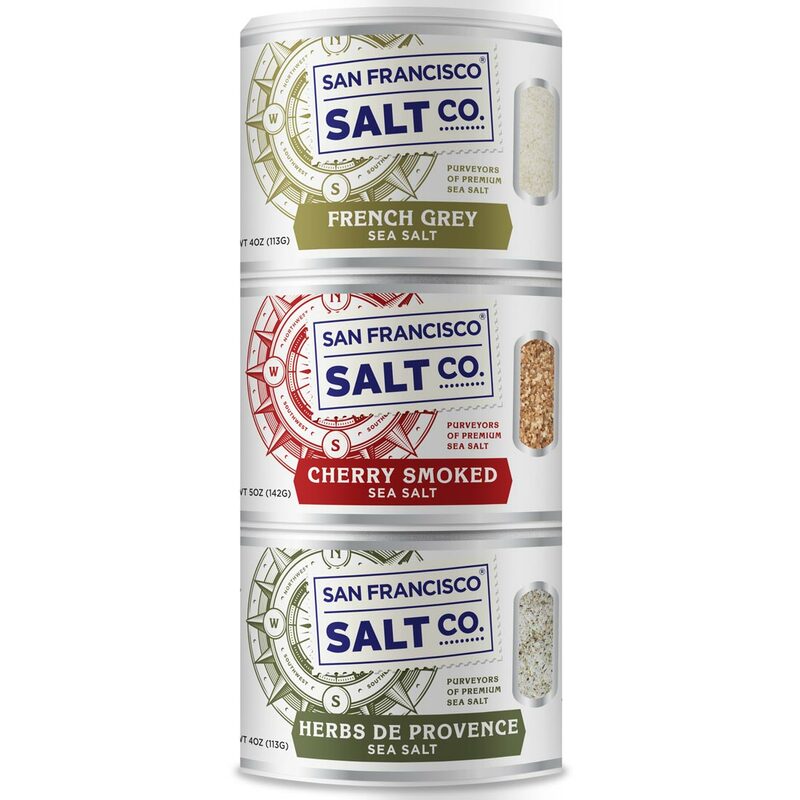 DESCRIPTION�- One stackable shaker of each of these popular and highly versatile salts: French Grey Sea Salt, Cherrywood Smoked Sea Salt, and Herbs De Provence Sea Salt. PACKAGING�- Stackable containers.�Plastic jars with shaker lids. Jars designed for stackability. 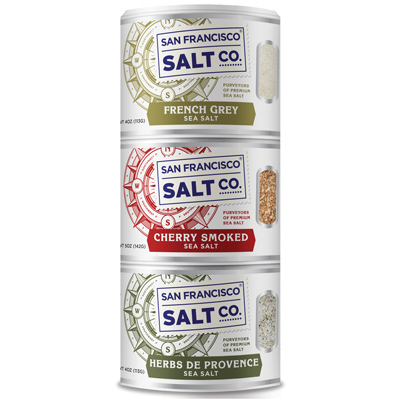 PROPERTIES�- Our 100% natural French Grey, Herbs de Provence, and Cherrywood Smoked Sea Salt are non-GMO, and do not contain any MSG, Soy, Gluten, Dairy, anti-caking agents, artificial colors, or additives.�We import only the highest quality food-grade salts straight from the source and package them in our U.S.A., GMP certified packaging facility, which is 3rd party audited by SCS Global. NET WEIGHT -�French Grey Sea Salt 4 oz;�Cherry Smoked Salt 5 oz; Herbs De Provence 4 oz. INGREDIENTS�- �French Grey Sea Salt: French Grey Sea Salt; Smoked Cherrywood: Smoked Sea Salt; Herbs de Provence:�Sea Salt, Rosemary, Thyme, Savory, Oregano, Marjoram, and Basil. SHELF LIFE�- French Grey: 10 years; Smoked Cherrywood: 10 years; Herbs de Provence: 6 months.